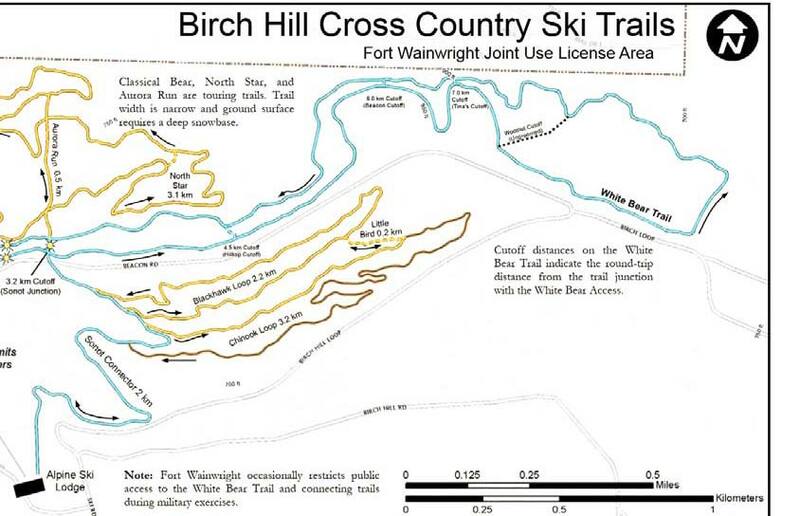 Although temperatures in town this morning were well below -30 deg F, the sun was out, skies were bluebird blue, and the temperature in the Birch Hill stadium was -16 to -18 deg F, depending on which thermometer you cared to believe. 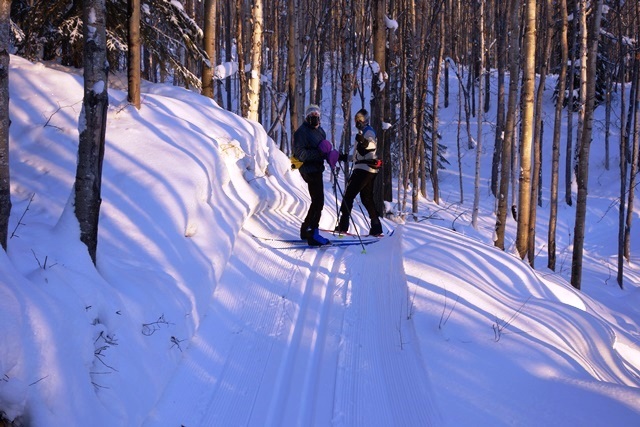 With days getting longer and the Sonot Kkaazoot just 11 weeks away, it definitely was a day to enjoy the enhanced sunlight of the South Side Classic Loops. 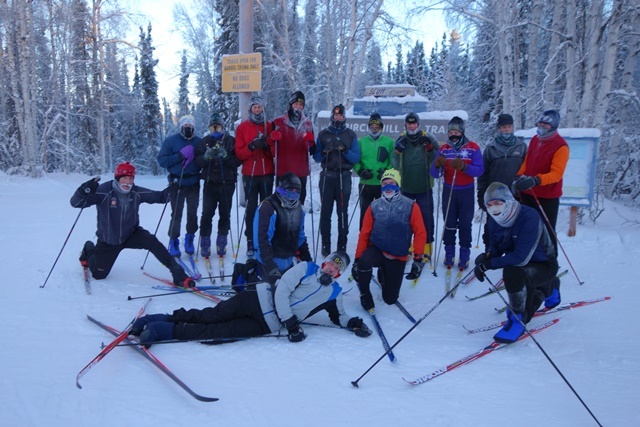 However, to warm up, we skied the Relay and Tower Loops before heading down the White Cub and White Bear to SCUM corner where we assembled for a group photo before crossing Beacon Road over to Fort Wainwright. Descending down the Sonot Connector, we skied past the Blackhawk Loop to the Chinook Loop that has bright southern exposure that warms a clear, chilly day. Here Robert and Sam stop briefly to help the Sonot blogger demonstrate ski conditions. The overachieving SCUM went ahead and did the other White Bear Classical Trails, but the group gradually found their way back to the warming hut for coffee and conversation while cars and bodies warmed up again. 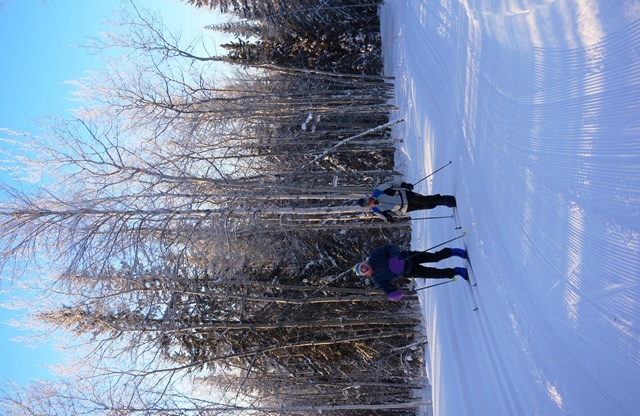 This entry was posted in Sonot Kkaazoot race organizers, Training Ideas and tagged Birch Hill Recreation Area, Blackhawk Loop, Chinook Loop, classical only trails, Fort Wainwright by Sonot Kkaazoot. Bookmark the permalink.